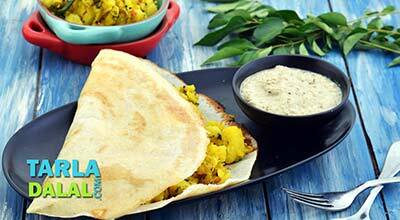 Rava dosa is a delectably crispy dosa that can be prepared instantly, without the need for any fermentation. 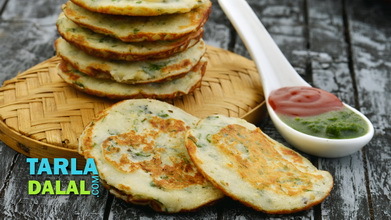 A traditional tempering and quick mix-in of chopped onions, coriander and green chillies add excellent flavour to a batter made of ready flours. 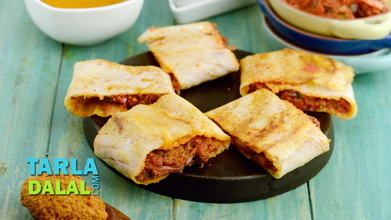 This dosa is indeed an irresistible option for breakfast, supper, snack or a sudden meal for a surprise guest. 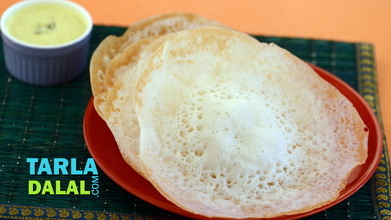 To make rava dosa, combine the semolina, plain flour, rice flour, salt and 1 cup of water in a deep bowl and mix very well till no lumps remain. Add 1 more cup of water and mix well. Keep aside. Heat the oil in a small non-stick pan and add the cumin seeds. When the seeds crackle, remove the pan off the flame and add the asafoetida and curry leaves, mix well and add it to the prepared batter. Add the coriander, green chillies and onions and mix well. 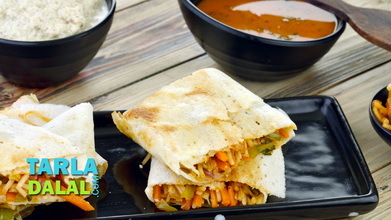 Heat a non-stick tava (griddle) and grease it lightly with oil and sprinkle little water on it and wipe it off gently using a muslin cloth. 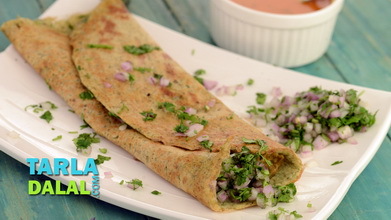 Pour ½ cup batter evenly on the tava (griddle), smear a little oil in the holes of the dosa and cook it on a high flame till it turns golden brown in colour or until crisp. Repeat with the remaining batter to make 4 more rava dosas. 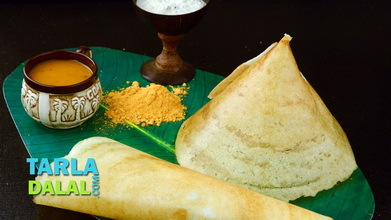 Serve the rava dosa immediately with sambhar and coconut chutney. 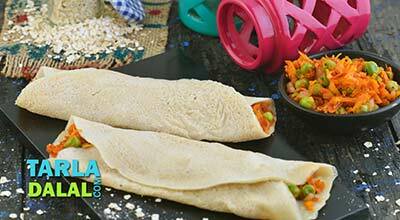 Tarla Dalal Hi Kavita , we are delighted you loved the Rava Dosa Video recipe. Please keep posting your thoughts and feedback and review recipes you have loved. Happy Cooking.